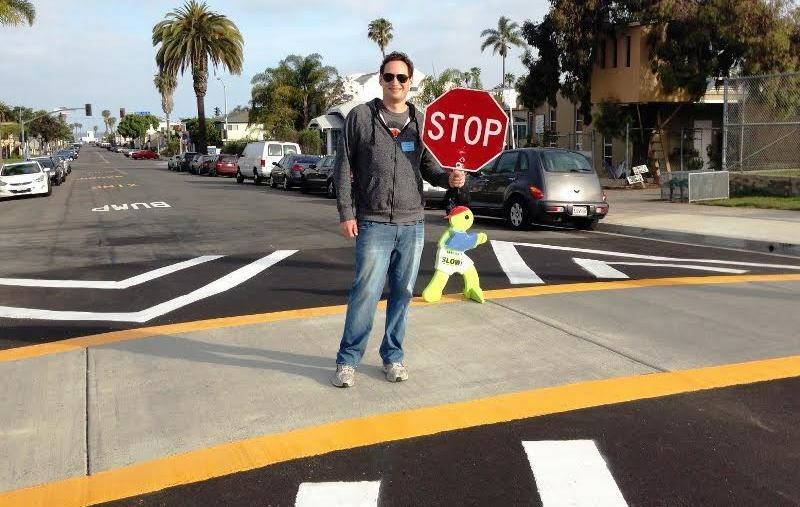 The author on his first day as a volunteer at the new OB Elementary School Crosswalk. 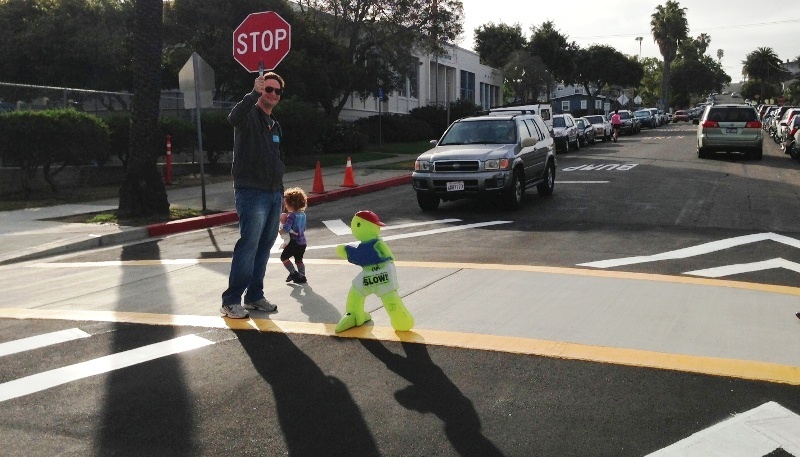 You might have heard about the new crosswalk that opened next to Ocean Beach Elementary School on Santa Monica Avenue. We’ve certainly talked about it enough. Now that the crosswalk is finally in place and the street is open again, you would think that all is safe with the school and the only looming threat for the kids are this week’s spelling quiz and forgetting their backpack. But that’s not the case, as I learned firsthand. In talking to the two volunteer crossing guards – Wayne Simard and Joseph “Moondoggie” Pina – they said it’s still pretty crazy in the morning rush and that people still don’t always stop for the kids. They complained about the new parking lanes the city painted on the street – a red “no parking” curb on each side of the crosswalk and a miniscule “3 minute parking” curb that barely fits one car next to it. They talked about their grand plans to get big crosswalk lines painted on all four corners surrounding the school. Maybe another similar crosswalk on Newport? The sky’s the limit for these guys – and Moondoggie talked of his plans to bring his ideas to the Town Council. We talked about the volunteer army they had built of parents helping direct traffic in the morning and they mentioned that most of the other volunteers had fallen off because of other commitments. Then I opened my big mouth. “You guys need volunteers? I’ll help you out,” I said, without thinking through the repercussions – least of which what else I could be doing at 7:15 in the morning. But it was too late for that. I was committed and there was no turning back. It’s for the kids. So there I was on Wednesday morning, holding a stop sign and shooing kids, parents and teachers across Santa Monica. It was a quiet start. A trickle of early-bird kids and ambitious teachers walked by, getting a head start on their day. Then the cars started coming, and I realized what the boys were talking about. This is hectic! Moondoggie directed cars dropping off to park on each side of the street while I kept an eye out for the next gaggle of 7-year-olds getting pushed along by their parents. Most of the kids were really nice. “Good morning!” I would exclaim in my best 7:30 a.m. voice. “Morning,” they would mumble as they shuffled across the street. A few would ignore me completely. To them, I would yell, “Have a nice day!” – like a street solicitor trying to get the attention of a passerby. For about 10 minutes there, things got pretty intense. Kids coming from both directions. Cars lined up on each side to drop their cargo off for the day, dodging the regular drivers picking the worst time to take a shortcut off Sunset Cliffs. Fortunately there weren’t too many of those. If you are one of those drivers, I beg you, please find a different route. You want no part of this chaos. And for the parents and kids making their way to school, hopefully I did my small part to make your morning easier. Or at least help keep everyone safe. So, I’ll be back to help again. It’s the least I can do for my new friends and for the neighborhood. A day without anyone getting hit is a good day for everyone. At some point during the morning, a parent made a joke about how we hadn’t lost one today. Not on my watch, I thought. Not on my watch. Woody is a Real American Hero. And Moondoggie sounds like one, too. Thanks for the kind words, buddy. Moondoggie is doing his best to make the world a better place. I meant big and little…wow. I should not be a crossing guard!! Thanks for your compassion and dedicating your time to protecting the youth…I wish more of our generation could appreciate it more. It’s sad how anti-social our society is. Whenever we say good morning to everyone we look like a weirdo, even though we’re trying to be kind and brighten up their day. Volunteering is the ultimate exercise in democracy. You vote in elections once a year, but every time you volunteer, you vote about the kind of community you want to live in. It’s still pretty epic that you were shunned by a few 7 year olds. In my mind I imagine them mumbling “go to hell” under their breath at you. Yep, one day we’re going to hear you’ve been elected Mayor of OB! Volunteering and blogging and no little ones of your own yet … that’s the true sign of a Crossing Guard Officer and a Gentleman!